A wave of loud, unrestrained laughter crashes through the conversation. The tall, slim young woman possessing black curls and sparkling dark eyes leans back in her chair against the door behind her. She continues to laugh and the man and woman in the other room go silent. The blonde woman asks, “Who’s that?” The dark-haired man, dressed in a silk robe, replies as he gets up, “That’s my wife. She’s delirious.” Who are the people in this scene? Why, it’s none other than Rosalind Russell, Robert Montgomery, and Joan Marsh playing the characters of Garda, Joel, and Bobby in a scene from Fast and Loose (1939). This is only one of many comical exchanges between Rosalind Russell’s and Robert Montgomery’s characters in this comedy, the last time they were paired together. 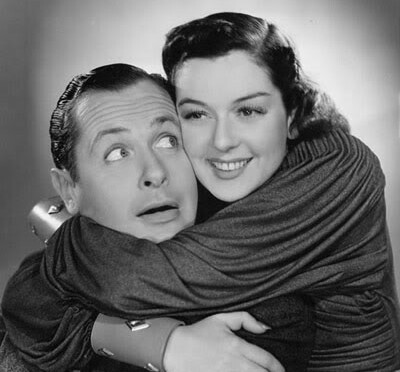 I think of it as being the end of an era because although when people think of classic film couples, they do not think “Robert Montgomery and Rosalind Russell,” they are a fun, free-wheeling film couple that are always a joy to watch onscreen. Fast and Loose is filled with cute little romantic gestures and actions between the two stars with plenty of whimsical lines to entertain the audience with. It’s something to watch when you want to forget your worries for a little less than an hour and a half and lose yourself in the world of the goofy Robert Montgomery-Rosalind Russell team. When the film opens, we (the audience) see a sign on an apartment door that reads “Milkman please leave one quart of aspirin tablets” and as the camera pans inside the apartment, there is another note tacked onto the telephone, which reads “Dear Telephone: One peep out of you and we will cancel all agreements.” The only thing we can gather from this is that the people living here are sleeping and refuse to be disturbed. Unfortunately, the telephone pays no attention to their threatening note and starts to ring. In the bedroom, clothes are strewn all over the floor and sleeping in twin beds (as was the custom of films, especially comedies, of the day) are a married man and woman named Joel and Garda. It doesn’t take long for Garda to be shaken awake by the sound of the telephone’s racket. She repeatedly calls out to Joel, but he doesn’t wake up. She feels on the ground for a walking stick and pokes Joel in the side, informing him that the telephone is ringing. He retorts, “Well, what did you expect it to do, sing?” She makes a face at him and says, “I do all the work around here while you lie in—“ She pauses to answer the telephone. “Hello?” They find out that it’s Mr. Oates (Etienne Girardot), an extremely absent-minded rich old man who wants to talk business with Joel. Joel is a rare book dealer and Garda also works with him. This opening gives us a glimpse into what kind of a relationship they share—wisecracks before they’re fully awake? Oh, yes! As they get up to get ready to go to the office, they stand up a little wobbly because they had a huge party last night. Joel asks, “What’d we have to eat last night, fried carpets?” And Garda says shakily, “I feel like I swallowed a jam session—jitterbugs and all.” When they arrive at the office, they walk straight through the door at the same time, but there isn’t enough room for both of them. Garda shoots him a dirty look and he lets her go first. Although his primary occupation is rare book dealer, Joel sometimes plays detective when the books in question get stolen, as they sometimes do. Garda hates it when this happens because he always gets into trouble. When Mr. Oates arrives, and he’s a delightful character, he calls Garda “Joel” and to prove to him that she’s Mrs. Sloane, she lifts her skirt a tiny bit and says, “Look!” He looks down and replies, “Oh, so you are, so you are!” As soon as he sits down, they all stare at each other in silence, and the scatterbrained old man says, “Well, what did you want?” even though he was the one who called them. Joel and Garda are excited to have a new client because they are having money troubles themselves. As they discuss telephoning an old buddy of his, Phil Sergeant (Anthony Allan), to get an invitation to the Torrent house, Garda sits on his lap. It is adorable when they do these cute little things and one of the reasons why I love this movie. For me, it’s not so much the plot, but the wonderful relationship between Joel and Garda. Joel decides to visit his friend, Dave Hilliard (Alan Dinehart), who is the Torrents’ lawyer. As he lays his head on a pillow on Garda’s lap, she ties a tiny little ribbon in his hair without his knowledge. He leaves and before he does, they “kiss” at each other, which is another thing they continuously do throughout the movie. Garda can’t help but interject: “Think of me, living with it for two years, Mr. Charlton!” Later that night as Garda and Joel get ready for bed, they look out the window and discover that Christina and their pal, Phil Sergeant, are a couple and seem to be very much in love. They separate before going inside so nobody thinks they were out there together. Garda smiles and says, “Aw, I think that’s cute. Remember when we used to do things like that to fool my family?” Joel comes back with the eye-rolling reply: “Don’t be ridiculous. Your family practically threw you at my head!” which causes Garda to almost choke on the water she’s drinking. They soon hear a crash downstairs and as Joel runs down to investigate it, Garda sighs and starts blowing air into a circular pool floatie, the same type that Joel had to sit on the last time he went investigating after being shot in the backside. There seems to have been an altercation between Wilkes (Ian Wolfe), the man who takes care of the Torrent library, and Charlton downstairs. When Joel returns to his bedroom, he lies down in his bed and immediately jumps up, giving his wife a dirty look as he tosses the pool floatie he found in his bed. He then listens to an argument in Gerald’s bedroom, which ends with Torrent (Ralph Morgan) slapping his son’s face. The next morning, Joel leaves the house before Garda wakes up to check up on a tough girl named Bobby, whom he learns is having some kind of romantic relationship with Gerald. In order to get into Bobby’s room, he pretends to be Gerald Torrent. Not long after he is allowed in to talk to her, police come in and arrest them both. Torrent has been murdered back at the house and Joel was gone around the time it happened. Eventually, they are let go, but the police bring Joel back to the house, handcuffed to Bobby, which leaves Garda suspicious, naturally. Knowing a man named Nolan (Sidney Blackmer), who is also involved with Bobby, may be a suspect, he decides to ask Garda out to his place called Nolan’s. He playfully twirls his finger in her hair, leaving it a big mess, which is both cute and rather funny. Once they are there, Nolan has a couple of his men kidnap Garda and keep her in another room while he talks to Joel. Before he can do anything, however, Joel grabs Nolan’s gun and says matter-of-factly, “Now I’ll tell you what you’re going to do. You’re going to call up and instruct those men to let my wife go. She’s to phone me from outside. I don’t want to sound melodramatic, Mr. Nolan, but to save my wife any discomfort, I would cheerfully kill a dozen guys like you.” Cue the “awwww” from all the ladies in the audience! Joel reaches back as if to hit her. She makes a face at him and swings the suit of armor’s arm in front of her. Suddenly, the piece of armor falls off, revealing a real arm underneath it. She screams and they find out there has been another murder—it is Wilkes’ body in the suit. Even though Garda has warned Joel not to see that Bobby girl again, he does and after he has a talk with her, she playfully sprays him with her perfume in order to make his wife jealous. When he comes back to the house, he knows he will be in big trouble. He walks around the room in circles, constantly backing away from Garda in order to avoid her. She wants to kiss him because she missed him, but he keeps backing away. Eventually, he finds himself backed up against the door and as she puts her arms around him, she smells the perfume and glares at him, calling him an “unspeakable toad.” However, the inspector suddenly calls for him and he is saved from his wife’s wrath. A man named Stockton (so many characters to try to keep up with!) has a Shakespeare manuscript that has been sold to him, but he is not sure who it was. There is the confusion over who has the genuine manuscript and who has the fake. Joel, who can tell these things right away, is called in to do this, finding a fake planted in Gerald’s room. Another situation calls for him to leave Garda at home, not wanting her in any trouble. He asks Oates to keep an eye on her for him. They sit in silence and Garda looks at Oates. She suggests that they play ventriloquist and pats her lap. He looks at her, confused, saying, “Huh?” She replies, “Skip it, Charlie.” The next day, Joel insists on talking to Bobby again, but Garda sits in the other room, listening to them, which is where the “my wife is delirious” line comes in. Joel feels like he’s so close to figuring it out, but he’s not. Just when it seems like all hope is lost, Charlton comes into Joel’s office, hugging the fake manuscript tightly to his chest. Joel is suspicious of the way he is handling it and discovers he has the real one and was the one who committed the murders. They get into a violent scuffle and Joel tosses his gun to Garda just in case. Watch her brilliant reaction to watching their fight: the way her eyes widen so comically and she makes those faces she would soon become famous for. In order to save Joel from getting hurt, she tries to shoot Charlton, but accidentally shoots Joel instead—yes, in the backside again! I wasn’t convinced I wanted to see this one until I read this review. It sounds like a hoot! I was hesitant to watch it the first time, and no, the writing isn’t stellar… but I think they are so cute so I do love it! love watching this movie..and enjoyed your wonderful review Des! I’ve been thinking about ordering this movie and your enjoyment of this film has convinced me that I would also like it. I read in The MGM Story that exhibitors were complaining about the length of time between the “The Thin Man” movies so MGM developed three films featuring the Sloanes as their married sleuths. Each one of these films has different actors playing the Sloanes. The three films were Fast Company, Fast and Loose, and Fast and Furious. It saddens me that this is the lasting pairing of Montgomery and Russell, one of my favorite screen couples but their legacy lives on thanks to people like you reminding us how wonderful these films are. Thanks Des your efforts are appreciated. Yes, I know there is a set of all the “Fast and…” movies. I have always been curious to see them, although I’m sure that I won’t love them as much as Bob& Roz because they are Bob & Roz. Were you planning on getting that set or is Fast and Loose available individually? I’m glad their legacy lives on, too. I wish they had made more films. But then Roz went on to The Women and became a big star 🙂 I’m glad you appreciate what I do. I appreciate your comments so much! I’ll have to go with the trilogy but I like 1930’s mystery movies anyway. My only reservation is that these are DVD-Rs, but the overall reviews are good. Yeah, sometimes that’s all you can get these days. My Night Must Fall from Warner Archive was technically a DVD-R and it looks wonderful. I did order the trilogy and Fast & Loose is on the May 2014 Rosalind Russell film festival, can’t wait. What is this Rosalind Russell if festival you speak of? Lol. Your birthday or something? Ah, yes– the May 2014 Rosalind Russell Film Festival! The mother/daughter event of the year! I hope Dad has plenty to keep him busy in the garage! Viewed Fast & Loose and enjoyed it very much. Only one complaint, not enough screen time for Roz.. I completely agree. Roz is always disappearing in that movie, which is a serious shame because she’s the best part, she’s hilarious! Agreed! I actually have a second complaint to add: what kind of awkward-sounding name is “Garda”??? it’s a TERRIBLE name.. .b leh!